The new writers of Paranormal Activity (Ryan Higa, D-Trix, Greg, Will, and Kyle) attempt to create the next sequel, Paranormal Activity 5! Paranormal Activity 1-4 was just a clone of the first film. Kyle suggests Paranormal Activity 6, while D-Trix ponders paraplegic activity. Meanwhile, Greg suggests a pear cuz they’re scary. Coming soon it’s “Pear That’s Normal Activity. Also check out his Saw spoof. This entry was posted in comedy on October 31, 2012 by Kevin Hsieh - channel APA. Rap group Das Racist teams up with comedy group Goatface Comedy for the music video for Das Racist’s single “Girl” off their Relax album. In the video, a guy (Fahim Anwar) in a mullet has a crush on a girl, so he hones his dance moves to seduce her. He does his dances everywhere for her from the library to an outdoor fountain to yoga class, but she doesn’t see to notice. Will his 80’s style dance moves help him get the girl in today’s Facebook world? You can get the single on or amazon. Listen to more Das Racist: Who’s That? Brooown! and Michael Jackson. So then now is funny feelings? This entry was posted in music on October 31, 2012 by Kevin Hsieh - channel APA. 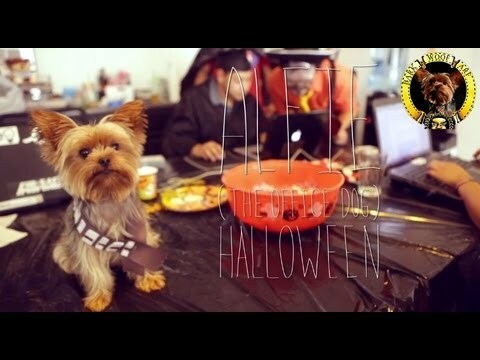 In Episode 2 of “Alfie The Office Dog” the webseries, we continue in the ISA offices with a Halloween party. Halloween has always been one of Alfie’s favorite holidays, so when the office has it’s annual costume party, he knows exactly what he wants to be! Too bad nobody else knows. Will Alfie’s crush and coworker Jenn (Alice Wen) figure out what character he’s dressed as? Will it be a trick or treat for him? Alfie the Dog is voiced by Wesley Chan of Wong Fu Productions. This entry was posted in comedy, shorts on October 31, 2012 by Kevin Hsieh - channel APA. In episode 5 of MotherLover, Angela convinces Tim to watch a DVD that Chaz (Ki Hong Lee – Always You, Take It Slow and Away We Happened) has made as a late wedding present for Angela that chronicles their relationship. As Tim watches the video, he realizes that he may be responsible for their love affair during his time away at the Peace Corps. How will Tim react to the video of his mom and Chaz? Coming this fall is the web series Squad 85 featuring Parvesh Cheena, Rizwan Manji, Danny Pudi. In 1985, The LAPD experimented with a secret Time-Travel Division, catapulting 4 of LA’s finest 25 years into the future… That future is now. Chris Larkin plays Bobby, our by-the-book, new recruit — here to help our Squad integrate into present day. Parvesh Cheena play Rickman, Dukakis High school’s shortbus driver & Squad85’s sociopathic Arch-Villain. Diedrich Bader plays the Commissioner responsible for bringing 4 of LA’s finest 25 years into the future. The series kicks off on November 13, 2012. After making the rounds on the Asian American Film Festival circuit this year, Nice Girls Crew debuts online. Nice Girls Crew features seminal actresses Sheetal Sheth (Reign, Three Veils, Looking for Comedy in the Muslim World, The World Unseen), Michelle Krusiec (Chinglish, Saving Face) and Lynn Chen (Saving Face, Surrogate Valentine) as three childhood friends who gather weekly for a book club, but never actually talk about the book. Their subjects of interest? Vampires, cannibalism, prescription drugs, and Teddy bears. Not to mention a healthy dose of lingering childhood drama. From award-winning Sundance helmer Tanuj Chopra (Punching at the Sun) and emerging writer/producer Christine Kwon, comes a new comedy about three best frenemies and their cray cray antics in a book club. (It’s like the female version of YOMYOMF’s The Book Club). Sophie (Lynn Chen) is the human rainbow bright, wreaking sunshine even as she reveals her inner Dexter. Geraldine (Michelle Krusiec) is the badly permed, cult leader potentate, whose talents range from spoken word dance performance to carefully balancing martini glasses. And Leena (Sheetal Sheth) is the unabashed thug-ess in heels, whose constant refusal to read the books is matched only by her trademark tardiness. When the three come together, it’s an unforgettable mix of taut one-liners, delusions of grandeur, and explosive conversation material. In episode 1 of Nice Girls Crew entitled “Out of Order”, Geraldine, Leena, and Sophie try to kick off the group together. The first book that the ladies discuss is Harry Potter and the Prisoner of Azkaban (Book 3 of the Harry Potter series). Starting out of order in the series doesn’t suit everyone and someone didn’t read the book. Looks like the rough start to the first session. This entry was posted in comedy, shorts on October 30, 2012 by Kevin Hsieh - channel APA.